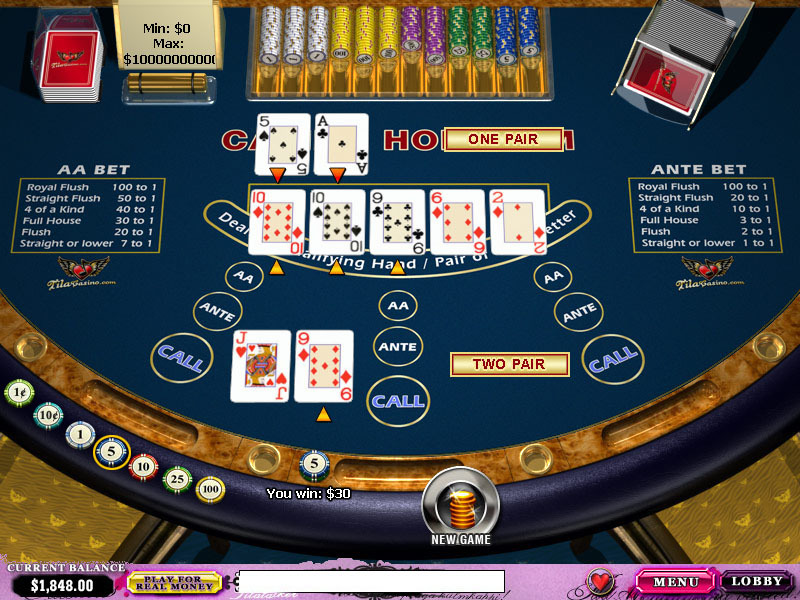 Casino Hold’em is a casino version of currently popular poker game Texas Hold’em. As poker players know, in texas hold´em players play against each other, but in casino hold´em, players play against the house. Player places an Ante bet and is dealt two hole cards plus three community cards (the flop). The dealer is also dealt two cards that are not shown to the player. The only choice is to either Play or Fold the hand. If player chooses to play, he places a Play bet that is 2 x Ante bet. If the player folds, he only loses the Ante bet. If player chooses to play, then last two community cards are dealt, dealer’s hand is revealed and player wins or loses depending on whether his 5-card-hand beats dealer’s hand or not. The hand rankings are the same as in Texas Hold’em with highest card determining winner in case of a tied ranking. There is also a rule, that the dealer needs to “qualify” in order for the hands to be compared. In Casino Hold’em the dealer qualifies with a pair of fours or better. If the dealer doesn’t qualify not having at least a pair of fours, then the player wins a payout on the Ante bet and the Play bet is pushed. There are some higher payouts for the Ante bet if the Player has at least a flush. The player has to win the hand to get the Ante payout. When the board comes with a pair, eg. 446, you never fold J-high or better and almost always fold T-high or worse, unless you have at least a gutshot to go with it. The times you do fold are paired boards mentioned above, and when you have very low cards eg. 73 that don’t connect with the board, or I middle card and one small card such as T2 that doesn’t connect. Eg. T8 is usually playable but T5 is not. At Real Time Gaming (RTG) casinos the game is called Caribbean Hold’em. In this variation the ante pays 1:1 when the dealer doesn’t qualify and not according to the paytable above. The house edge is higher (1.17%) with these rules. The standard deviation per unit wagered at Casino Hold’em is 1.61. The value is larger than in Blackjack so you should expect larger swings when playing through a bonus with Casino Hold’em. Because Ante bet has some high payouts for rare hands, you should expect your balance to drop slightly faster until you get a high-paying hand. Remember that you have to stake 3x the Ante bet for every hand you play. Therefore it is recommended to use a smaller ante bet size than when playing blackjack to avoid busting early on.